Home » Eco-friendly Wedding Favours Shop » Unusual & Unique Wedding Favours » Personalised Seed Packet Wedding Favours » Recycled Coloured Packets » Marigold Seeds Wedding Favour – Marry-golds! Tags: bee seeds, seed packet favours. 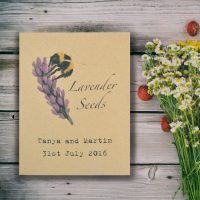 Categories: Recycled White Packets, Unusual & Unique Wedding Favours, Personalised Seed Packet Wedding Favours, Recycled Coloured Packets. 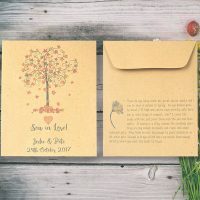 Fabulous recycled white seed packet containing Marry-gold seeds (love the play on words!). Pot Marigolds are beautiful, orange hardy annuals, meaning they can withstand frosts and cold weather but only live for a year. They grow 1 – 2 ft (30 – 60 cm) high and have bright orange-yellow flowers, which are long-lasting if deadheaded regularly. Their old folk names include Ruddles, Butterwort, Cowbloom, Summer’s Bride (how appropriate!). They are great flowers for attracting pollinating insects. Calendula officinalis is the name for Pot Marigolds – the seeds are very easy to sow – simply sprinkle them onto pots of compost and water. Once flowering is over, masses of seeds are produced which you can collect and sow again next year! 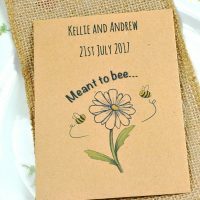 The seed packet is personalised with your wedding details – please advise these in the box above. Sowing instructions are printed on the back. You will get about a gram of Marigold seeds. Early Christians called the plant Mary’s Gold and placed it around statues of Mary, offering the flowers in place of coins – Mary used the blossoms as coins. Legend says that Mary’s purse was stolen by thieves and when they opened it Marigolds fell out. Marigolds represent the rays around Mary’s head and are used in festivals associated with her. The Romans were also keen on Marigolds, using the dried petals as a substitute for the very expensive Saffron in cooking. Petals were also used in infusions to treat indigestion. It was also believed that if held in the hand then fever would decrease and plague would be avoided. The Medieval herbalist, Gerard, tells of barrelfuls of Marigold petals being sold in grocers shops due to high demand for them in broths. Marigold was a well-known pot herb, ie, pot herbs were those that were cooked as opposed to being eaten raw. Marigold tinctures can be used on coldsores when they start to tingle in the early stages and then used diluted later. Soak bandages in Marigold tincture for wounds. For toothache, press crushed petals against the tooth. Marigolds have antiseptic properties, can soothe pain, stop bleeding and promote healing. Marigold tea is reported to be good for gum problems. Some rather quaint superstitions surround the Marigold. Carry Marigold petals and a Bay leaf in sachets if you find yourself the subject of gossip. If adding Marigolds to love sachets, collect them at noon. Scatter flowers under the bed for prophetic dreams and to ward off evil. Hang garlands of Marigolds across doorways to prevent evil coming in. Mix Marigolds with Hollyhock buds, Wild Thyme and young Hazel buds and you will see fairies. If your lover has trodden on some soil, dig up this earth, put it in a pot and plant a Marigold in it – if the plant flourished then your lover was faithful. Marigolds attract hoverflies and wasps – the hoverfly larvae feed on aphids and, if you plant Marigolds amongst your vegetables, the wasps eat the caterpillars that live on the vegetables. Marigolds can also ease wasp or bee stings by rubbing petals over the wound. Marigold ointment can soothe and heal warts and burns. Boiled flowers yield a yellow dye. Caution – Do not confuse with the Tagetes marigold, which is inedible and toxic. Always seek advice before using plant medicines.